Is your summer as hot as ours? Our poor plants are so distressed. I try to water once a week (when we are home) but it isn't always possible. We've lost at least 5 shrubs so far this summer. I'm proud to report that I've been busy designing the next free BOM. I have the first row just about ready to begin stitching. This one is going to be so much fun. Stitching the perfect inner point has been a real bug-a-boo for me. I do pretty well on my own projects but teaching someone else how to do it perfectly every time is a skill that has eluded me. I feel as though I made a real breakthrough a couple of weeks ago. I was working on a block that had jagged leaves - lots of inner points - 32 in all. I decided it was a good opportunity to experiment. Later in the newsletter I'll describe my newest hint. I hope you will all try it and let me know how it works for you. 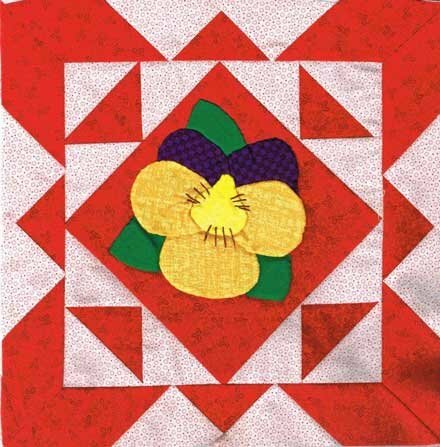 Coralie Williams of Yeppon, Queensland, Australia has sent a photo of her "Pansy" block from Karen's Gingerbread Florals. It is so exciting to see Coralie's quilt develop. It also makes me feel so humble that someone in Australia is following along as I publish this quilt. It is truly a small world that we live in. I would love to share your project made from my patterns with my readers. Just send a photo of that project to me at abqhaidle@mchsi.com. The sharing of ideas is what quilting is all about. I'm looking forward to sharing your photo with my readers. Jerry and I just returned from Petosky, Michigan. where we had a wonderful time with the quilters in the Little Traverse Bay Quilters Guild. This very active group made us feel so welcome. 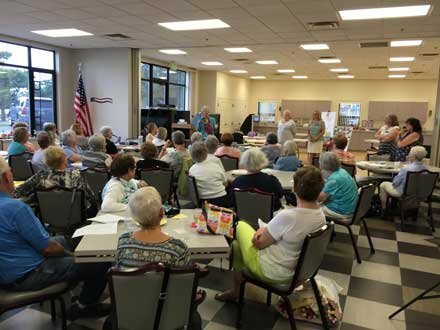 I gave a trunk show for their August meeting in the Emmet County Friendship Center. We had a workshop the next day at the Charlevois Public Library in Charlevois, MI. They were a wonderful group of both beginners and intermediates. Jerry and I would both like to thank you for all the work you did to make our trunk show and workshop such a success. How are pins and needles made? I realize that I'm repeating information about this video. Please forgive me if you have already seen it. For those of you who missed it the first time around, it is worth taking the time to view. As we all know, inner points can be really hard to stitch. We must cut into the point but that always produces many cut ends to deal with. Here is a tip that I have found solves many of the problems. Begin your inner point by cutting into the point. Make only 1 cut. Be sure it goes as deep as necessary the first time. The more times you clip, the more little ends you will have to deal with. Just before stitching into the point, swipe a pin through a fabric glue stick. Get a little glue on the end of the pin. Be careful. Don't overdue. A little goes a long way. Now "paint" the glue on the seam allowance on both sides of the clipped seam allowance. Be sure that the glue is only on the seam allowance that will be turned under. 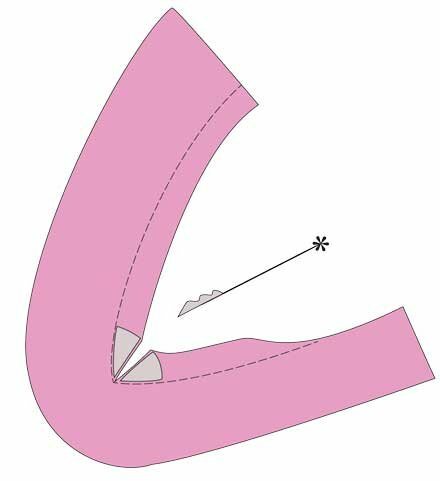 Use the pin to "paint" the glue on the seam allowance. It is very easy to get too much glue. You will barely be able to see any glue on the end of the pin. The diagram to the right shows in gray the "glue" that is on the pin and how it is to be "painted" on the seam allowance. I have found that when I turn under the seam allowance, the glue that is on that seam allowance will keep "Pokies" from happening. It is so nice not to have to deal with them. I hope many of you will try this little tip and let me know how it works for you. 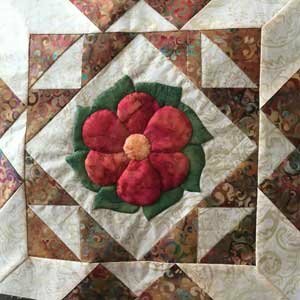 Karen Johnson, Webster City, Iowa for whom "Karen's Gingerbread Florals" is named, has completed her quilt. It is gorgeous. Karen has sculpted all of the flowers and leaves. 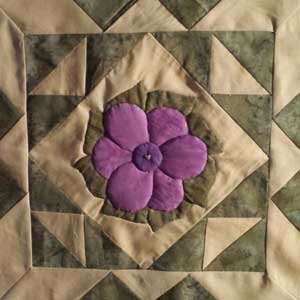 Angela Wirth of Mended Hearts Quilting did a fabulous job of machine quilting this quilt. 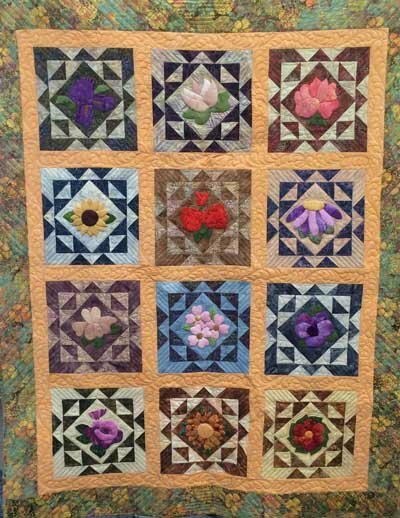 The quilting really makes the flowers pop. Karen, thank you so much for working with me on this quilt. I'm quite envious. My quilt top is done ready to be quilted but I don't like it nearly as much as yours. 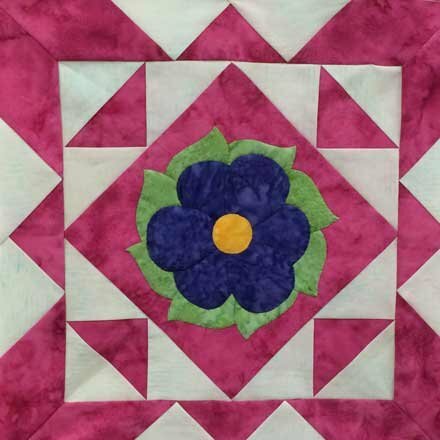 Dear readers, if you have quietly been working on this quilt but have not as yet shared photos of your work, we would love seeing your blocks. Please send your photos to me at abqhaidle@mchsi.com I'll crop them and square them up so you don't have to worry about that. Download August Block - "Impatiens"
Download July Block - "Zinnia"
Download June Block - "Pansy"
Download May Block - "Water Lily"
Download April Block - "A Simple Rose"
Download March Block - "Cosmos"
Download February Block - "Rose"
Download January Block - "My Favorite Rose"
Isn't it fun seeing the different interpretations of a simple motif? It reminds us to look deeper than the single suggestion that is usually provided with a pattern. Almost any design can be done in almost any colors and fabrics. There are exceptions but we need to ask ourselves if a design that we like that is not in our colors can be stitched in our favorite colors. Usually the answer is "Yes". Karen's block is to the left. Georgie's block in to the right. Click here to download this newsletter in a PDF file.